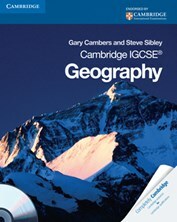 Cambridge IGCSE Geography is written specifically for the Cambridge IGCSE by two highly respected authors who are both senior examiners with extensive experience of training Cambridge IGCSE teachers worldwide. This coursebook with CD-ROM supports teachers in the delivery of the Cambridge IGCSE curriculum, offering expertise, building confidence and providing guidance in preparing for examinations. Cambridge IGCSE Geography is endorsed by Cambridge International Examinations, ensuring that it is tailored to the requirements of the syllabus. Introduction; Part I. Geographical Themes - Preparing for Paper 1: Theme 1. Population and settlement; Theme 2. The natural environment; Theme 3. Economic development and the use of resources; Part II. Geographical Skills - Preparing for Paper 2: Part III. The Alternative to Coursework  Preparing for Paper 4: Resources; World map; Glossary; Index; Acknowledgements.